Please join me in welcoming author Lisa Tucker to Musings of a Bookish Kitty. She was kind enough to answer a few questions for me. If you haven't had the chance already, please stop by and read my review of her novel, The Promised World. Literary Feline: It is great to have you with us today, Lisa. I have always been curious about people's routines, so I have to ask: how do you begin each day? Lisa Tucker: I feel it’s important to have some time every morning to do absolutely nothing. Even if it’s only five minutes or so, it helps me make the transition from sleep to the world. I usually spend this time out on my back porch, daydreaming and drinking a glass of Diet Coke. Literary Feline: I know this is an over-asked question, but it really is one I wonder about: how did you get your start writing? Lisa Tucker: I was working on my dissertation in American literature when I decided to take a little break and write a short story. As a grad student in English, I’d read hundreds of novels, but I’d never tried to write any fiction. I didn’t consider myself the creative “type.” The first line of the short story was “My sister Mary Beth is a song reader.” This became the first line of my first novel—after the short story grew and grew and I finally accepted that I loved writing fiction and I wanted to keep going with it, even if it meant I would never finish my dissertation. Literary Feline: It was impossible not to think of all the mass killings recently when I began reading your book; people shooting up families, gyms, schools or what have you and then turning the gun on themselves. Billy is not like those murderers, however. It hadn't been his intent to take anyone out with him. What prompted you to set up his death the way you did? Lisa Tucker: I don’t like violence, and I avoid it in my books when I can. Unfortunately, in Billy’s case, this wasn’t possible. I don’t feel like I chose what he did as much as he told me this was the way he had to do it. It fits his character in many subtle ways, but it’s so sad that I often wished as I was writing the book that it could have begun some other way, and that Billy was still alive. Literary Feline: The Promised World is a complex novel that touches on child abuse, mental illness, and the fragility of memory, all of which takes a serious toll on not only the individual but also on the family as you demonstrated so well in your novel. When you first set out to write The Promised World, had you planned on tackling such issues or did it come as a surprise as the idea for the novel unfolded? Lisa Tucker: I never plan my books, and so most of the issues that arise in the course of the novel are surprises to me. This is one of the things I love about writing. I feel like the characters teach me new ways to look at the world—all I have to do is follow them around and listen to their voices. Literary Feline: Music and books figured prominently in the novel. How much, if at all, are they apart of your own life? Lisa Tucker: To quote Lila, my books are my friends. I feel like both books and music are necessary. They make life more beautiful—and more bearable. Literary Feline: If Lila were here, what book do you think she would recommend to the readers of my blog? Lisa Tucker: She’d recommend the subject of her dissertation, Herman Melville’s volume of short stories, The Piazza Tales. The title story alone is fabulous. Literary Feline: Are you reading anything at the moment? Lisa Tucker: Notes from the Underground by Dostoevsky. I’m re-reading it for no reason other than that it caught my eye. Literary Feline: Thank you so much for dropping by today, Lisa, and answering my questions. To learn more about the author, Lisa Tucker, and her books, visit her website. 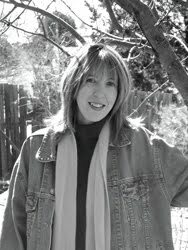 Lisa Tucker is the author of Lisa Tucker is the author of five novels: The Song Reader, Shout Down the Moon, Once Upon a Day, The Cure for Modern Life, and The Promised World. Visit TLC Book Tours for a list of Lisa Tucker's tour stops! Good morning Bookish Kitty-I posted a video of the kitties in August under the heading Am I seeing Double-come and view it-I think you will have a smile. Great interview. I always find it interesting when authors say the characters told them how to write the story. I can't imagine that. I guess that's why they're authors and I'm not. I agree with Kathy...I'm always surprised by how many authors admit to not planning out their books, or letting the characters drive the story. It kinda goes against everything we were always taught...although I guess that applies more to essays and non-fiction. Stacy - I do too. I know they aren't the most popular blog posts, but I personally love getting a peak behind the scenes and into the mind of an author. I have heard a few authors say they do not plan out their books, that they are driven by the characters. I've also heard from many more who do prefer to outline, but even those still say that sometimes the characters take them in a different direction than originally planned. I guess it's different for everyone. As a planner, I'm in awe of an author who can get away with writing a good book without having a plan, however vague, ahead of time. Wonderful interview. I always love getting a glimpse at an author's creative process. I'll add this book to my "to be read" list. I have just started The Promised World, and I can't wait to get back to it. I really enjoyed Once Upon a Day and The Song Reader. Great interview! Iliana - Thanks! I really did enjoy the book and hope you get a chance to read it. Christine - I'll have to try the two books you mention by her. This is the first Tucker book I've read. I am glad you are enjoying it so far! Alice - Thank you! I am glad to hear you enjoyed some of her other books. I hope to read them myself one day.